Scott watches countless hours of boxing each week. His specialty is Asian Boxing and he covers the Asian scene on both Ringnews24 and Asian Boxing. His articles are very insightful and anyone who doesn’t follow the Asian scene can keep up-to-date by reading his articles. Over the last few years we’ve been seeing more and more Japanese fighters rave through the rankings at a young age. We’ve seen fighters like Kazuto Ioka, Naoya Inoue, Kosei Tanaka, Daigo Higa, Ken Shiro and Hiroto Kyoguchi all usher in the current golden age of Japanese boxing. Whilst the current top young Japanese fighters appear set for some long reigns and the opportunity to further grow the brilliant Japanese boxing scene, they aren’t alone, and there are a number of other youngsters following in their footsteps. One such fighter is 23 year old Ryota Yamauchi (2-0, 2) who made his professional debut last June but looks set to be one of the next Japanese put on a rocket to the top of the sport. Like many other Japanese fighters who have raced away to success in recent years Yamauchi did have some notable amateur success, at least domestically. In the unpaid ranks he went 38-15 (14), a decent record on the tough Japanese University scene even if the numbers don’t truly show it. As an amateur he had made a mark at the under-15 level and had faced off with Takuma Inoue, the younger brother of Naoya Inoue. It was due to that amateur pedigree that he claimed a B license ahead of his debut back in June. That debut saw him take on Thai visitor Supaluek Noiwaengphim at the Korakuen Hall and almost immediately Yamauchi looked like a star in the making. He looked razor sharp with both his hands and feet, moved gracefully around the ring and kept a tight guard whilst trying to draw mistakes from the Thai. It wasn’t quite the “wow” factor of a top tier amateur making their debut, but it was the type of performance that instantly impressed and didn’t just look like a youngster in there with someone to blast out. Instead it was a composed performance, a chance to show what he was about and a chance to turn heads, before taking the Thai out with some brutal yet beautifully placed body shots. If his debut was about showing what he was about his second performance was about making a name for himself, as he took the chief support position and battled former OPBF title challenger Lester Abutan. With 21 bouts under his belt Abutan was highly regarded, the GAB Light Flyweight champion and a man who had only been stopped once, by the then OPBF champion Ken Shiro who claimed a world title just 5 months later. Despite the experience that Abutan had he was made to look wild and crude by Yamauchi, who controlled the distance, countered well and despite catching some shots clean never lost his composure. It was a tricky fight, with Abutan showing a very unpredictable approach to offensive boxing, but one that ended in a flurry of shots from Yamauchi who forced the referee to save the Filipino. 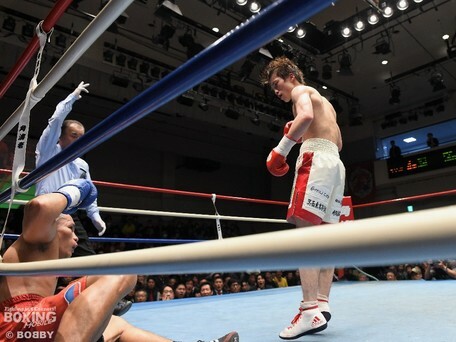 At the moment there is no sign of when Yamauchi will return to the ring, but he is ranked #11 by the OPBF at 108lbs and will almost certainly be looking to claim a title belt before the end of the year. He may not be fast tracked quite as quickly as Kyoguchi, Tanaka or Inoue, but I’d be very surprised if he wasn’t fighting for a world title within his next 10 bouts. I can’t help but be impressed by what I’ve seen of him, and suspect others will also be impressed when they get a chance to see one of Japanese next super talented youngsters. David Price vs Alexander Povetkin: Match Up or Mismatch?